Fans of Power Star Puneeth Rajkumar are all geared up to see their idol onscreen after over a year, in tomorrow’s release, Natasaarvabhowma. And some treat it promises to be since the actor will be seen in a never-before-seen avatar. Puneeth plays an investigative photojournalist in the movie, and the story has a supernatural undercurrent. 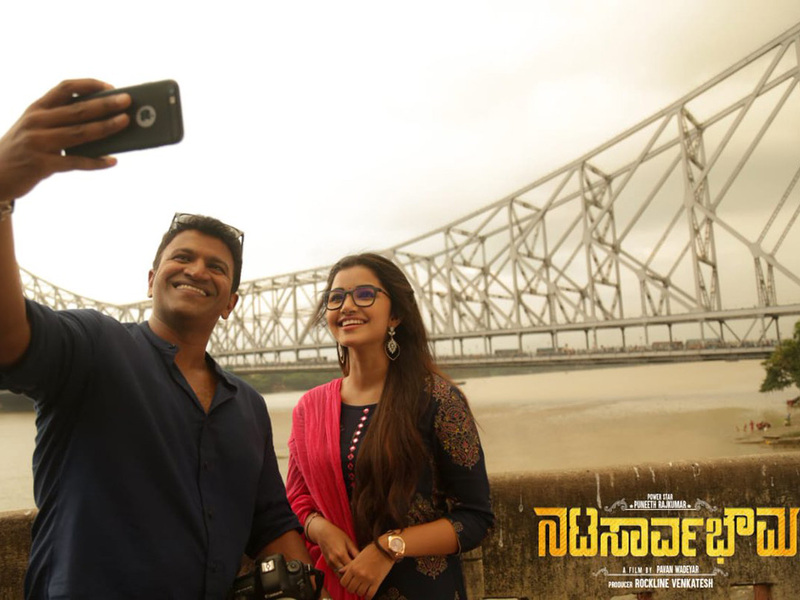 Apart from the different storyline, what makes the movie one to watch out for is that Puneeth did not have a single release in 2018. 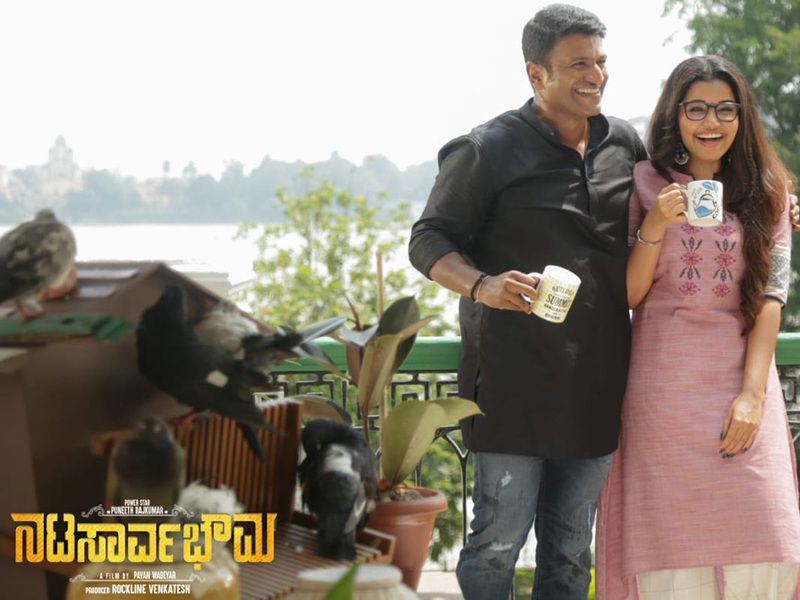 Written and directed by Pavan Wadeyar and produced by Rockline Venkatesh, Natasaarvabhowma also has Rachita Ram and Anupama Parameswaran in lead roles. The ensemble cast includes B Saroja Devi, P Ravi Shankar, Sadhu Kokila and Chikkanna. The trailer left the viewers wondering about the genre of Nata Sarvabhouma. Is it a horror film and does it have a reincarnation story? What is the movie all about? It is a cross-genre movie. I want people to go and watch it in the theatre. I would say like to say it is a proper Kannada entertaining movie. How did this movie with Pavan Wadeyar happen? There has always been a plan to join hands after Rana Vikrama. We had discussed a couple of subjects, but things did not happen. This particular script was floating around for a very long time. After we planned to make a film on this script, Pavan came on board. The original script is written Janardhan Maharshi. Rockline Venkatesh roped in a few scriptwritersto reworks on the storyline. We have Mr.Chethan who have written the dialogues. It’s been a busy week for Power Star Puneeth Rajkumar. Not only is he gearing up for the release of Natasaarvabhowma, his first since the 2017 Anjaniputra, but he is also taking baby steps as a producer and is prepping the teaser of his debut production, Kavaludaari, which will be out along with his film. Amid promoting his own film and discussions about Kavaludaari, we caught the Power Star for a quick chat. Not having a release last year was not a conscious choice. In fact, we wanted Natasaarvabhowma to hit theatres in November 2018, but for reasons beyond our control, that didn’t happen. The film is a full-fledged entertainer with a lot of twists and turns. I play a photojournalist in it. The film actually came to me in 2010 or 2011 and was originally written by Janardhan Maharshi, who had done Aakash and Arasu with me. Over the years, we made a lot of changes to the script and eventually, director Pavan (Wadeyar) came into the picture and tweaked it further for the betterment of the final product. This film is for any member of the audience to enjoy and has all the elements that an Indian film needs. This is my 28th film and I think I have a long way ahead of me to try a lot of different genres in films. Natasaarvabhowma, no doubt, stands out from my earlier films and characters. During the debate series that we had about the issues plaguing the Kannada film industry, one of the suggestions was that A-list actors needed to have released more often. Do you agree? Definitely! All of us who are in the business of cinema and want people to come to theatres need to do a lot of films, no doubt. That will help bring theatres back on track. Last year, I wanted to do a couple of projects, but the scripts did not work out for me to start them on time. If Natasaarvabhowma had released in 2018, I would have perhaps started another film that year. Hopefully, 2019 will be better and I will start a few films together. Get Your Fill Of Game Of Thrones At These Screenings In Bengaluru!